Roman Numeral Gold Diamond Wedding Ring : LOVE2HAVE UK! A Roman numeral diamond wedding ring measuring 4mm in width and made of 9ct white gold. It comes set with two 3pt (2mm) brilliant cut white diamonds in between the Roman numerals. A polished or satin (pictured) finish option is available. Please note that we don't rhodium plate our white gold rings - they all come in their natural colour which is an attractive off-white/very pale yellow. 9ct yellow gold is also available so please email us for further details. 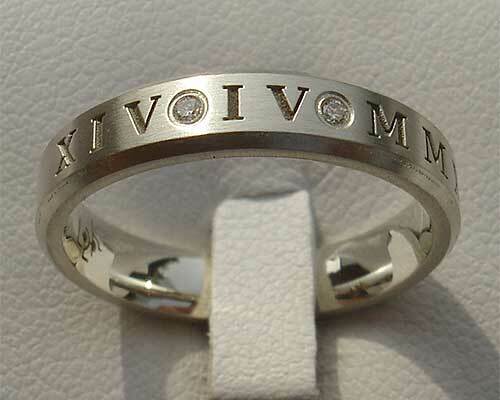 You can decide what you want in Roman numerals on the outside of the ring. 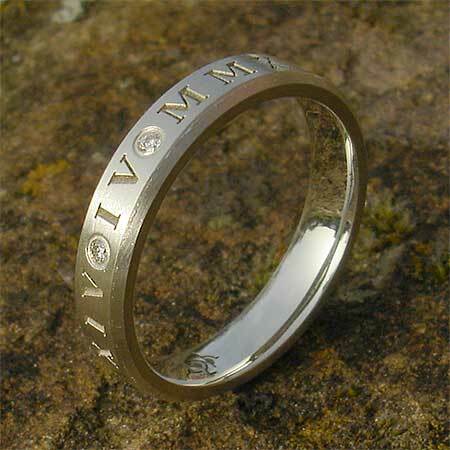 The personalised Roman numerals engraving included in the price is FREE! - Just enter your requirements into the comments box at check out. We can translate the date for you if you are unsure.